Penny tries to hang with the Coin Clique, but she usually feels left out. The other coins, especially Quarter and Half Dollar are best friends, do everything together, and tell Penny she isn’t worth much. Then one day Penny lands in a pocket with the beautiful, gold dollar coin. Dollar is different from the silver coins too, and she starts to teach Penny how special and valuable she really is. With Dollar’s help, Penny learns to feel as shiny on the inside as she looks on the outside. 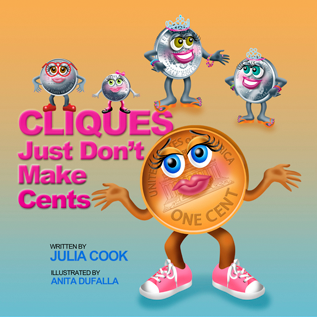 Cliques Just Don’t Make Cents is a book that helps kids understand the emotional toll that cliques can have on those who are excluded from popular social groups. It also teaches children how to build better relationships. This is the second children’s book in the Building Relationships series from Boys Town Press.